HS2 is a large, complex and ambitious programme which is facing cost and time pressures. The unrealistic timetable set for HS2 Ltd by the Department means they are not as ready to deliver as they hoped to be at this point. The programme for High Speed 2 (HS2) is facing cost and schedule pressures with options for extending the opening date for phase 1 now being considered and steps are being taken to bring cost estimates within available funding, according to a report by the National Audit Office. The 2026 target opening date for phase 1 is at risk despite good progress with some major procurements. The Department for Transport (the Department) has asked HS2 Ltd to revisit the programme schedule in order to increase confidence for delivery from 60 % to 80%, without increasing costs. It has also asked HS2 Ltd to assess the impact of extending the timetable for opening Phase 1 by up to 12 months. Since the NAO reported in 2013, the Department and HS2 Ltd have made significant progress in preparing to deliver the programme. They have issued tender documents for major civil engineering contracts on phase 1, and plan to announce the preferred route for phase 2b later in 2016. In 2013, the Committee of Public Accounts raised concerns about the ambitious timetable for High Speed 2, and today’s report states that the Department set HS2 Ltd a schedule for achieving delivery readiness that was also too ambitious. The Department and HS2 Ltd delayed the first of three formal review points – which tested HS2 Ltd’s readiness to deliver – by ten months because HS2 Ltd would not reach the required level of capability in time. By May 2016, HS2 Ltd had the capability it had planned to reach in July 2015, but did not pass review point 1 owing to concerns about cost and schedule. It is important that HS2 Ltd builds and embeds the organisational capability, and produces fully assured plans to enable it to complete work on schedule, and to gain the delegated authority to deliver the programme efficiently. The programme faces cost pressures. Phase 1 is currently forecast to cost £27,384 million, exceeding available funding by £204 million. There is less contingency to deliver phase 1 than the Department and HS2 Ltd were aiming for at this stage, and this forecast assumes that planned efficiencies totalling £1.47 billion will be realised. Cost estimates for phase 2 are at a much earlier stage of development and some elements are unfunded. At the 2015 Spending Review, the estimated cost of phase 2 exceeded available funding by £7 billion. Since then work by the Department, HS2 Ltd and a review commissioned by the Cabinet Office has identified potential savings of £9 billion, £2 billion of which have been secured. There is a risk that the combined impact of cost and schedule pressures result in reduced programme scope, and lower the benefit cost ratio. The benefit cost ratio for phase 1 assumes that the programme is delivered well within its available funding. If the outturn is closer to, or exceeds, available funding, which, given current cost and schedule pressures, is a possibility, then the benefit cost ratio, including wider economic benefits, would fall from 1.7 to around 1.5. If the programme is delayed, then benefits would be deferred. The Department has asked HS2 Ltd to explore options for reducing the programme scope in ways that do not have a significant impact on programme benefits. The £55.7 billion funding package does not cover funding for all the activity needed to deliver the promised growth and regeneration benefits which is the responsibility of local authorities. There is risk that these benefits will not materialise if funding cannot be secured. The main exception is Euston where the Department is planning to carry out works to enable further development above the HS2 station at Euston, at an estimated additional funding requirement of around £417 million. The Department and HS2 Ltd have developed a structured plan for delivering regeneration benefits at an early stage. 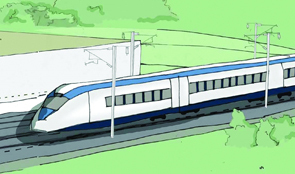 Plans are more advanced than they were on, for example, HS1, where benefits have not materialised as expected. The Departments for Communities and Local Government and Business, Innovation and Skills, and local authorities are working well together, given the early stage of the programme. According to today’s report, effective integration of HS2 with the wider UK rail system is challenging and poses risks to value for money. The Department will need to address a number of issues including how HS2 services will complement or compete with other rail services, and how HS2 will interact with proposed improvements in the North. Failure to fully understand these interactions and make decisions in the right sequence will make delivering the programme more challenging. It could also mean decisions are made now which reduce benefits or increase costs across the network in future. The Department is now developing a long term vision for the whole rail system.